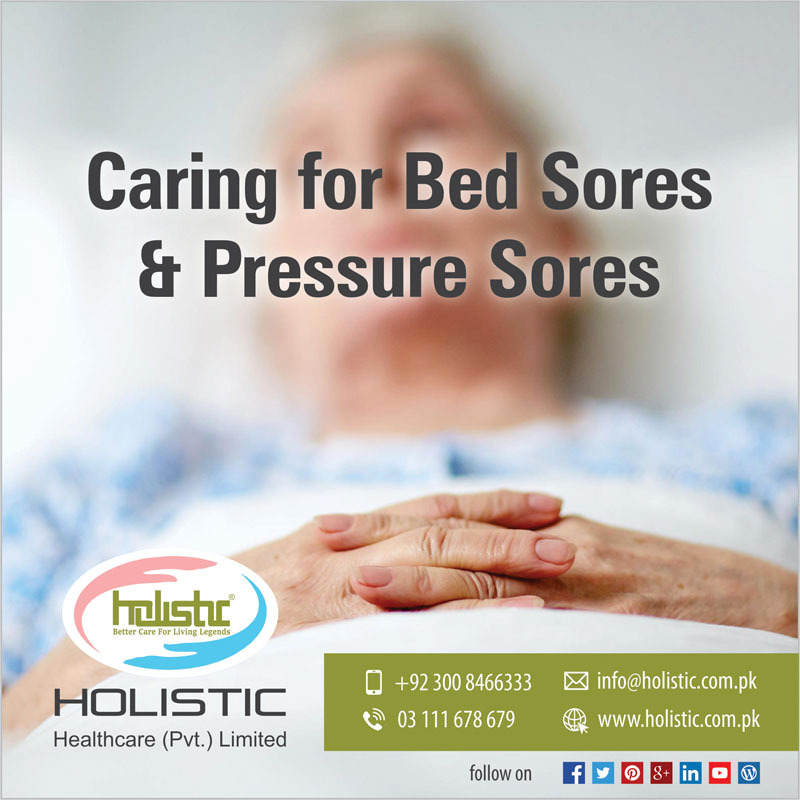 Bed Sores or pressure sores are one of the crucial kinds of sores as they damage skin that is generally close to your bones. They are caused by staying in one position for a long period of time or when a bedridden person cannot do much movement and stays mostly in the same spot. Bed sores are generally very painful and sometimes get infectious too if not taken care of properly as soon as they begin to appear on the body. The assistance of home health services can prevent such critical and aching sores from getting worse and recovery can be made easier and quicker. Bed sores, pressure sores or pressure ulcers may appear on the skin closer to the area of your bones such as on the ankles, back (spinal cord), elbows, heels, and hips. People who are completely bedridden, on a wheelchair, or are ill for a longer period of time and cannot change positions are specifically at high risk of developing these pressure ulcers. As their name specifies, they are a result of too much pressure building on any part of the body for an unusual span of time. The pressure prevents blood from getting to your skin and the skin dies, the nerves send messages of pain to your brain to let you know that you need to change your position, but damage to your spinal cord keeps these messages away from reaching your brain and hence builds these critical sores. Some pressure sores are life-threatening and can be a serious problem for people engaged in home healthcare. These sores develop in stages and the trick is to identify them in the early stage, which can enable treatment and reduce the risk of complications. An experienced and professional nurse or medical attendant should be able to identify the development of pressure sores on a patient. The caregiver or attendant should also be able to provide treatment of the pressure sores effectively. – The very initial treatment starts by keeping pressure off the sore. It will help in healing as well as become less painful for the patient. – Taking care of cleanliness and hygiene can prevent these sores in keeping them away from getting infectious and fatal. Clean the sore with mild soap and water, and then keep it dry as much as you can. – Taking care of the patient’s diet can benefit in healing bed sores. Keeping a check if enough calories and nutrition are provided to the patient is necessary and can help in prevention as well as in the treatment of sores. – Taking care of the kind of mattress the patient has been lying on, seeing if the wheelchair cushion is suitable for the pressure sore patients, transfers, pressure releases, and changing positions every few hours can be another milestone in treating pressure sores. – Taking care of the sore by removing damaged tissues from over the pressure ulcer can help it in healing properly. These sores need to be free of damaged or infected tissue. Removing this tissue for instance by gently flushing the wound with water or cutting out damaged tissue can be another treatment of these pressure sores. – Last but not least, a large pressure sore or very infected pressure sore that fails to heal might require surgery in few cases. There are various methods of surgeries that can help remove these sores. For instance, the process of surgical repair uses a pad of your muscle, skin or other tissue to cover the wound and cushion the affected bone is also known as flap reconstruction. Pressure sores or bed sores are very uncomfortable and painful and people suffering from these crucial sores for too long may end up in social isolation or depression. The very beginning of the treatment of these sores may start by talking to the patient’s home nursing services for support and comfort. Care at home also depends on the family and friends of people living nearby who can facilitate the residents and work with nursing staff to ensure proper preventive care by communicating and meeting them on a regular basis. The feeling of isolation must not gather around the patient as mental stress also prevents healing of any kind of sore. If your patient is suffering from pressure sores which are becoming difficult for you to manage, get professional help. We have trained staff and nurses who can take care of your patient or loved one at the comfort of your home. Give us a call today at 0300 8466333 to know how Holistic Healthcare (Pvt.) Limited can be of assistance.